As we are venturing into the larger ocean of learning, this webinar presented why we need to consider to move into the realm of mobile learning. However, I thought I would do a little research outside to see what the forecast is for mobile learning. Engage your entire learning community by providing access. Enhance teaching and learning with mobile devices to increase teacher efficiencies. With Blackboard Mobile Learn, we would be able to push out content and provide users access taking learning with them where ever they go. As we look at how to engage our learners, this would be one step closer to building a community of learners by allowing anytime/anywhere access. As we look at how Blackboard Mobile Learn can expand learning for our community of learners as well as on our tri-campuses, let's take a look at some of the data that has been recently published on mobile learning. According to Ambient Insight, who recently published a market analysis in August 2010, US is a late adopter of mobile learning. Japan has become the top mobile learning country in the world with South Korea and the UK following. 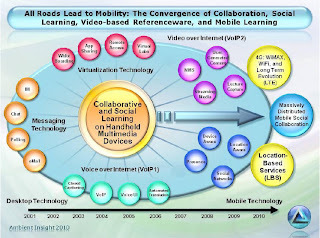 2nd Generation: Mobile Collaboration (connected G4 multi-purpose devices, Wi-fi or WiMAX, cloud-based, peer-generated content, mobile augmented reality-based learning, and real-time video and conferencing. As my role of being an educator first, I wanted to explore how we can use the current educational methodologies and trends in research to look at mobile learning. 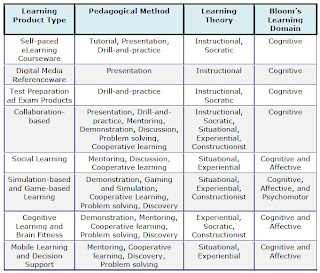 Below you will see a chart that identifies the learning product with the pedagogical method, learning theory, and Bloom's learning domain (click on image to see article). One of the common terms coming up is collaboration and social media. The research presented phrased this as Collaboration-based Learning. Below is a chart to emulate how all the pieces tie together. To sum up the report, take a look at the chart below which represents the current state of mobile learning and projections for 2014. 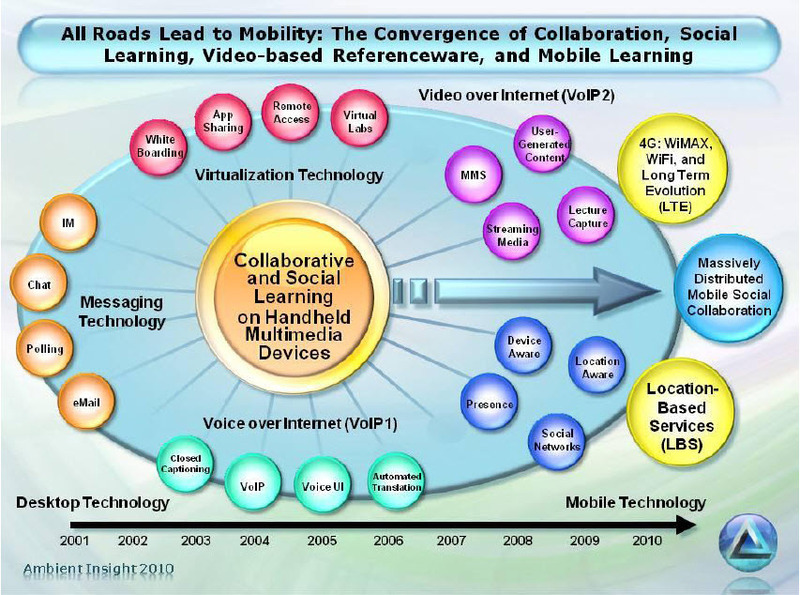 So, after looking at the presentation put on by Blackboard and going outside to do some research on current trends, the question remains "Are we ready to move into the mobile learning era?" Thanks for sharing this interesting data. I like the chart that matched the teaching strategy with the learning domains. I've always been a firm believer in bridging the cognitive and affective domains to increase comprehension, motivation, engagement and retention. I think the question for us now is: "What will it take to integrate effective mobile learning both in planning(objective, outcomes), training and funding?"